A man has died and another hurt following a crash in Neath Port Talbot during the early hours of Saturday. 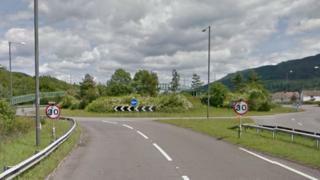 South Wales Police said a silver Renault Clio left the road at the roundabout on the A465 around Resolven. The 42-year-old driver died at the scene and his 57-year-old passenger was taken to hospital but his injuries were not life-threatening. Anyone with information about the incident, which happened just before 02:00 BST, should call 101.